RECENTLY A SNAKE HANDLER WAS BITTEN AND KILLED WHILE SHOWING A BROWN SNAKE TO AN AUDIENCE DURING A DEMONSTRATION IN SYDNEY, WHILE A BRISBANE-BASED SNAKE HANDLER WAS KILLED BY HIS TAIPAN. In another incident in 2009 an audience member at a demonstration was inadvertently bitten by a Tiger Snake. The event was terminated as he was rushed to hospital in a coma. He survived after receiving intensive care for three days and several ampoules of antivenom. However he was critically ill and there were permanent long-term effects from the bite. An expensive lawsuit was the expected outcome. The government licenced demonstrator had long-term experience with handling venomous snakes but had been unable to avoid the incident. There have been numerous other serious bites, (fatal ones and near-fatal, so-called “near misses”) involving snake handlers in Victoria and elsewhere in Australia and "innocent" members of the public who have also been bitten by deadly snakes that were not properly contained or had "escaped". See the partial list here. Only Snakebusters can give a watertight guarantee that there will be no such accidents at their demonstrations. Only Snakebusters have vet certified surgically devenomized snakes that comply with Section 32 of the OH and S Act 2004, in Victoria. Only Snakebusters can legally demonstrate venomous snake species in Victoria under new laws and only Snakebusters can guarantee NO RISK. 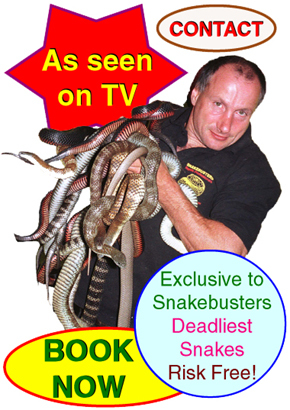 Only Snakebusters can say they don’t inflict pain on their snakes with sticks or tongs when doing presentations. Snakebusters put the welfare of their animals and the public’s safety first! Partial list of recent serious bites involving government licenced snake handlers, including their trading companies. It's official, Snakebusters are Australia's best reptiles!